With the recent release of “Hacksaw Ridge,” a film telling the story of U.S. Army medic Desmond Doss’s heroic actions at Okinawa, attention has been drawn to veterans of the Pacific campaign. 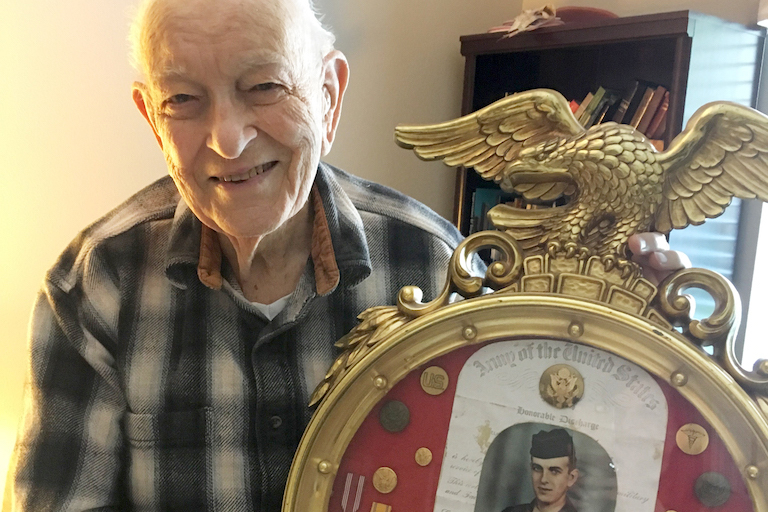 For Elmer Hart, a resident at Harbor Place of Cottesmore in Gig Harbor, Washington, the movie was a reminder of his own experiences as a medic. He too served in the Battle of Okinawa. A Seventh-day Adventist like Doss, Hart was a pre-med student at Walla Walla College, an Adventist school in eastern Washington, when the war broke out. He was drafted in 1943 and was a natural fit for serving as a medic. He trained at Camp Robinson in Arkansa. Hart had an easier time in the Army than Doss did – he doesn’t remember being picked on for his beliefs, even his refusal to bear arms. His commanding officers were more understanding and accommodating. Hart served in the 102nd Medical Unit, following the 27th Infantry Division as it invaded Pacific islands held by the Japanese, including Saipan in the Marianas, as well as Okinawa. Because the medical unit was kept at a distance from the battles, Hart never felt in great danger, except for one instance when a Japanese soldier got about 50 feet from him. “He threw a grenade at me, but it didn’t go off,” Hart remembered. At Okinawa, Hart’s battalion rendered aid to casualties as the 27th attacked another ridge not far from Hacksaw Ridge, where Doss was lowering dozens of injured men down the cliff. Hart did his own medical work on the beach. “We had quite a number of patients to take care of,” Hart said. One incident in particular gave Hart the chance to be a hero when no one else could. When a badly injured lieutenant was carried to the medical station, Hart was the only one with the same A-positive blood type. He saved the man’s life by pumping a pint or two of his own blood into the man’s system. On Veterans Day, Nov. 11, Hart and his son and daughter-in-law went to see “Hacksaw Ridge” in the theater, bringing back memories of the battle for Hart. The Battle of Okinawa ended in June 1945. The atomic bomb dropped on Hiroshima on Aug. 6, and on Nagasaki on Aug. 9. The 102nd went on to other islands in Japan, where Hart was for about two months before coming home for good. He learned a lot during those three years, including medical experience that he would carry on to his career as a family physician.